African American soldiers fought the Confederacy with valor, but they struggled mightily against prejudice in their quest for acceptance. to catch their breath at the top of each hour. At about 2:00 pm, having covered 16 miles, they stopped. As they rested, the crackle of musketry sounded from ahead, followed by the booming of cannons. “That’s home-made thunder!” said one soldier. The men grabbed their rifles and cartridge boxes, leaving their packs behind so they could move quickly. As they closed the two miles to the battlefield, they passed wounded men and stragglers, including men from the 8th United States Colored Troops, a green unit. They called to the Massachusetts men, “We’re badly whipped! You’ll all get killed!” The Confederates were well entrenched in a wooded area. The corps commander, Brig. Gen. Truman Seymour, arrived on horseback. “The day is lost,” he said to the 54th Massachusetts’ white commanding officer, Colonel Ned Hallowell. “You must go in and save the corps.” Hallowell led his regiment to the left while other Union units went to the right. They charged forward. Nearby a badly wounded New York regiment was so impressed by the courage of the black soldiers that they rallied, fixed bayonets, and joined the 54th Massachusetts. The battle went on for more than two hours. The 54th Massachusetts stood its ground and fired volley after volley into their gray-clad enemy. Some of the new recruits were so nervous they forgot to withdraw their ramrods after reloading and sent them flying at the rebels. A sergeant told them to drop the rounds down the barrel and smack the butts of their rifles against the ground to seat them. Some actually improved their rate of fire that way. Before long they began to run low on ammunition. The unit next to them mounted a charge but was bloodily repulsed. That regiment began to fall back, leaving the 54th Massachusetts’ flank exposed. Seymour wanted to retreat, but the African American soldiers did not want to give ground. Confederate cavalry was beginning to hit both flanks; however, so Hallowell had no choice but to order them back. It took some coaxing, but finally the men complied. The 54th Massachusetts is famous today thanks largely to the 1989 film Glory. Its sister African American regiments, the 55th Massachusetts Infantry and 5th Massachusetts Cavalry are less so, although all three deserve recognition for their achievements during the American Civil War. 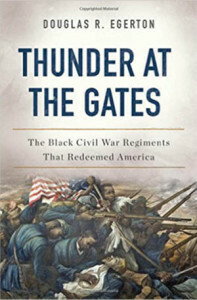 These units and the legacy of African American soldiers are deservedly advanced in Thunder at the Gates: The Black Civil War Regiments That Redeemed America (Douglas Egerton, Basic Books, New York, 2016, 429 pp., maps, illustrations, notes, bibliography, index, $32.00, Hardcover). The first commander of the 54th Massachusetts, Colonel Robert Gould Shaw, fell leading the regiment forward into the teeth of Confederate guns at Fort Wagner in Charleston, South Carolina, on July 18, 1863. “Tell it with pride to the world!” These words were written to Shaw’s family following his death. They referred to the regiment and its stand alongside white units. That is what the author has done in this book. He informs readers of the achievements, struggles, and suffering of the three African American Massachusetts regiments that joined the fight against the Confederacy. It is a triumphal tale well told, although the men of these units never received the thanks they so richly deserved. The accounts of the unit’s veterans are expertly woven into the story. The work sheds fresh light on a subject which, although well known, has never before been conveyed in such rich detail. Tags 54th Massachusetts Regiment, Confederacy, Fort Wagner, Robert Gould Shaw, Union Army, United States Colored Troops.